The world has changed a great deal since Ebenezer Chapel was built in 1835, but the purpose of the Chapel and the message that is preached there has remained unchanged. 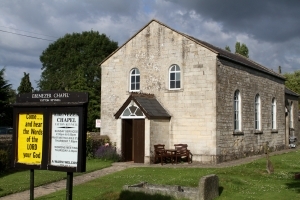 Those men and women who were instrumental in building the Chapel all those years ago obviously had a concern for the spiritual welfare of the inhabitants of the village. They saw the need for a place wherepeople could meet to worship God and hear his word preached. The Chapel is still as relevant today as it has ever been. Regular Services are held in the Chapel on Sundays at 2.30 p.m. & 6.00 p.m. and Thursdays for Bible Study & Prayer Time at 7 p.m. Ladies meetings are held monthly at 2.30 p.m. on dates to be advised. For further details contact 01249 782500 or 07979796854.